He was just a day old when people tried to sell him for a few dollars. If Albert the Super Cow shares anything in common with the Man of Steel from comic book lore, it's that they both began their lives amid desperate circumstances. Albert was just a day old - and he was already being sold off at an auction house in New York state. When the bids came in for Albert, they were in the smallest increments. $40? Do I hear $40? After all, who wanted to pay a premium for a day-old animal who was constantly crying for the mother he had been torn away from? Albert could scarcely stand on his own. Nonetheless, some people thought Albert's life was worth any price. Tracy Murphy wanted to take him home to Asha Sanctuary - the animal refuge she had just founded in New York. "I ran across Albert in a pen," Murphy tells The Dodo. "He was only one day old. He was sick. He was so thin. 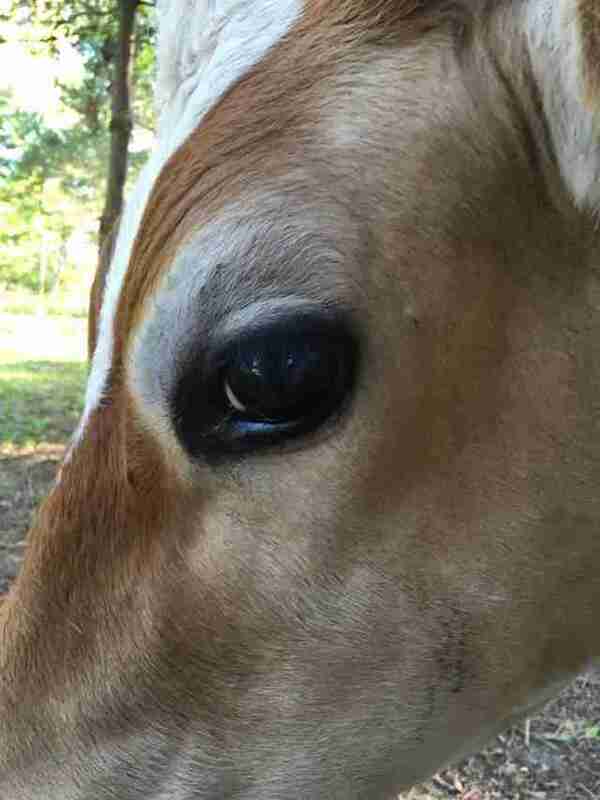 He was mooing for his mother. And he was falling down." $45. Do I hear $50? Others at the auction just wanted the baby steer for his meat. $50. Do I hear $55? "When he came up for auction, I started bidding like crazy," Murphy recalls. "I was so scared because there were others bidding for him." Sold for $60 - to freedom. And so Albert defied the earliest odds, and instead of being sold for the sum of his parts, he went to Asha Sanctuary - where he would be cherished for all that he is. But at first, this little calf didn't seem long for this world. He was feverish and couldn't even lift his head. Murphy piled blankets on him, trying to keep him warm. And tried to replace the mother's milk he had been missing - the milk all babies need to build their immune system. When the veterinarian arrived, her diagnosis was devastating "The first thing she asked was, 'Are you going to eat him?'" Murphy says. "No. We're going to save him," she replied. "We're a sanctuary." The veterinarian left, after expressing grave doubts about Albert's chances. But then Albert, so desperate for a miracle, got a kind of bovine intervention. "I got down on my knees," Murphy recalls, her voice breaking. "And I prayed for a miracle." Then she turned to Albert and whispered in his ear: "You know, Albert. I just want to see you as a great big bull one day. I know you can do it, baby. I know you can do it. Because, one day, people from all over this community are going to know about you. "You're going to touch so, so many lives." 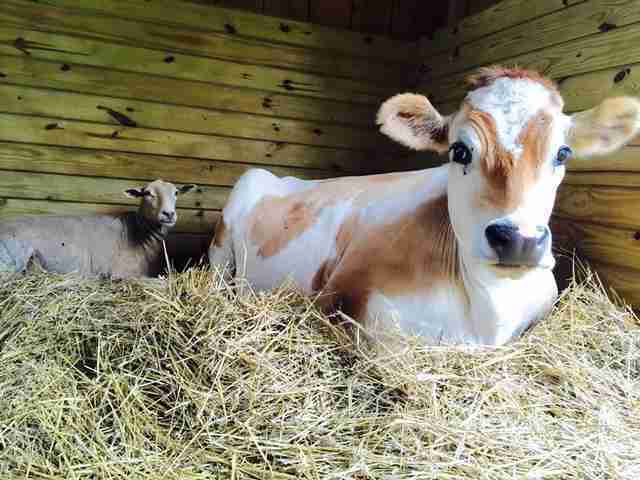 The next morning, this wobbly calf, for the first time, raised his head. The Cow of Steel, indeed. "After that, he just started growing stronger." And also more comfortable with his new life. In fact, today, so much about Albert's new life is about play. Even his name. 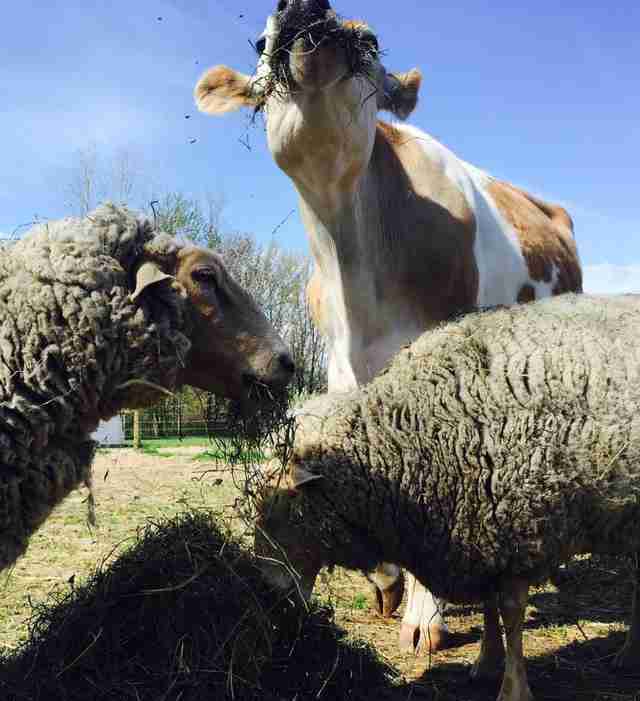 "Albert is actually a steer," Murphy says. 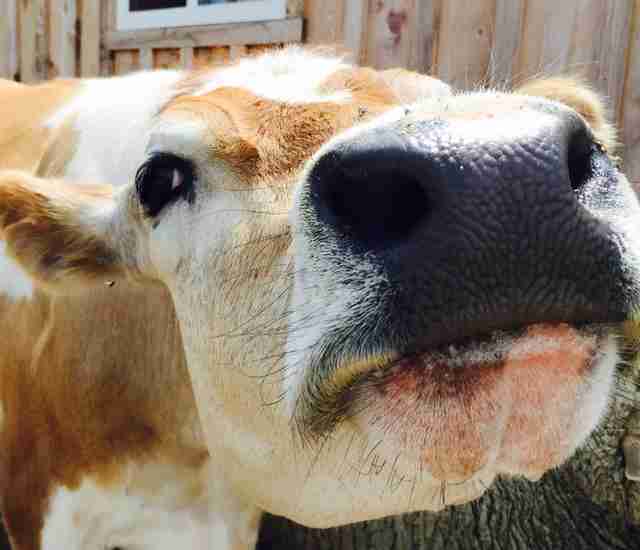 "He's a male, but we refer to him as a cow because most people know about cows. They know more about cows than steers. And he doesn't mind." 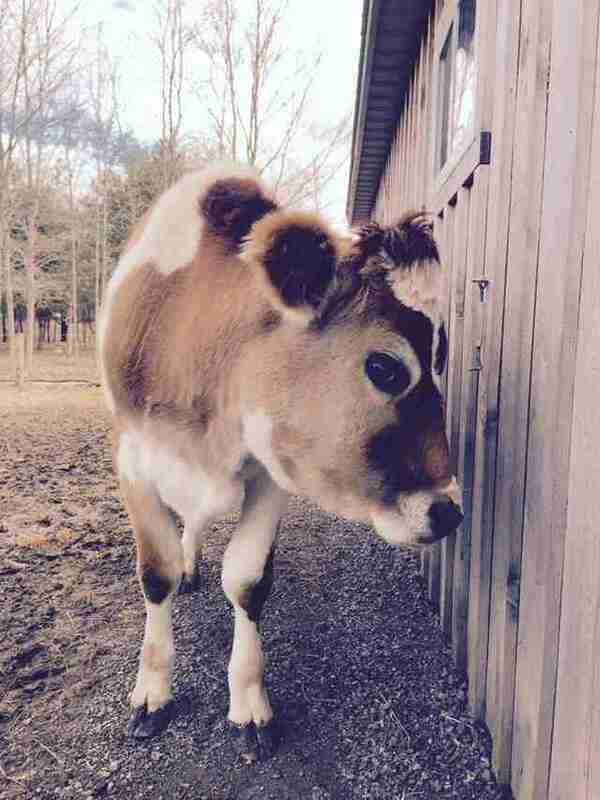 What Albert does mind is if you don't play hide-and-seek with him in the woods at the sanctuary. "He gets a kick out of it when I join him in the woods," Murphy says. "Just like my dog would." 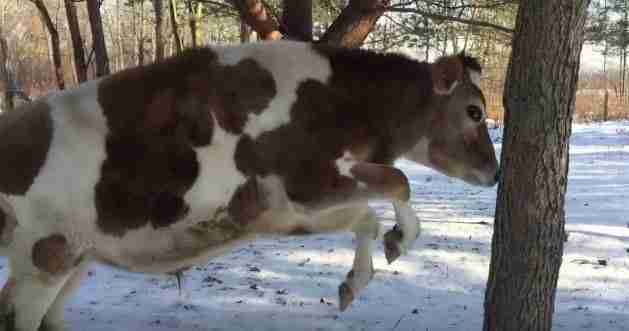 Murphy recently recorded a frolic in the woods with Albert the Super Playful Cow. "He was actually trying to get me and I was hiding behind trees. It's kind of like a hide-and-seek game that we play together." Look over there! Behind that tree. It's a bird. It's a dog. 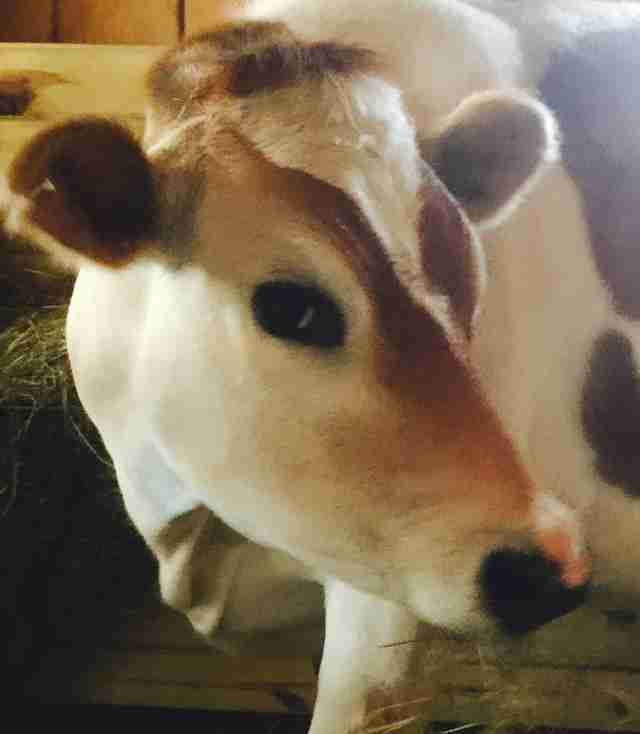 It's Super Cow. You can follow Albert's adventures on Facebook. And, if you would like to support Asha Sanctuary in its mission to save animals, consider making a donation here.